On Sunday I wrote about my excitement at my team, the Washington Redskins, returning to relevance with their first division title, and first home playoff game, since 1999. Sadly the excitement was short-lived, as the season came to a shuddering halt, along with quarterback Robert Griffin III’s injured knee. Fingers crossed it’s not as career threatening as it looks, but it’s definitely a nasty one. My post-season blues were very quickly shrugged off, though, as I had something else to look forward to – an NFL fan night to be held in Edinburgh the following evening. 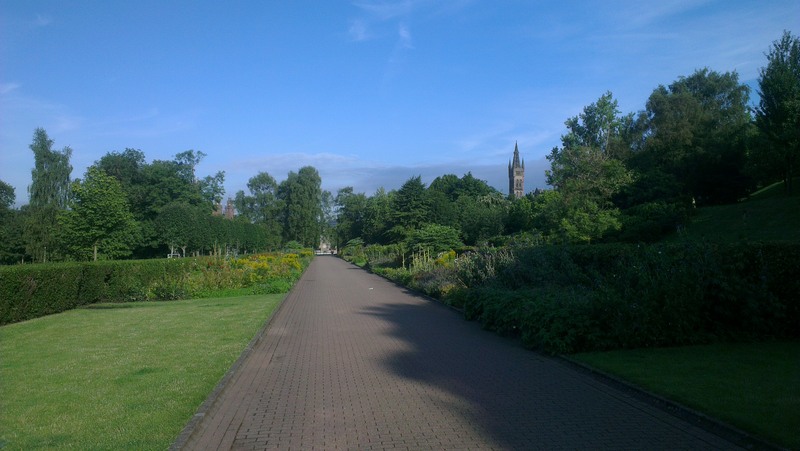 Although I hadn’t been lucky enough to secure tickets, my friend Ian had, and so it was that we headed through to Auld Reekie not really knowing what to expect. We arrived at the venue, the rather magnificent Hub, about 10 minutes before the evening was due to begin, and found ourselves decent seats in the middle of the hall. I reckon about 200 fans were in attendance, mainly decked out in NFL jerseys or other merchandise, and with most of the league’s 32 teams represented – exactly the kind of thing I expect the organisers were expecting to see. 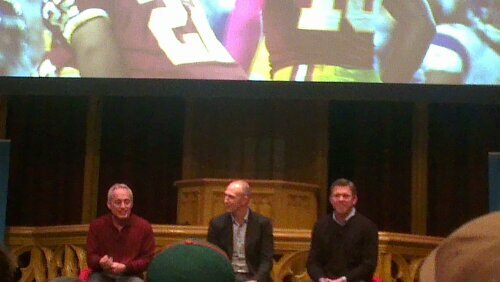 After a brief welcome from Sky Sports’ Neil Reynolds, the evening began with a film, Barry Sanders: A Football Life. Now I love NFL Films, who’ve been setting the standard for sports documentaries for a long, long time. And this retrospective of one of the best running backs of all time (third best, according to his own father!) didn’t disappoint. The mix of archive footage and interviews, mixed with modern day interviews was perfectly presented, and I learned a lot about a player I remember fondly but didn’t have much opportunity to see play. 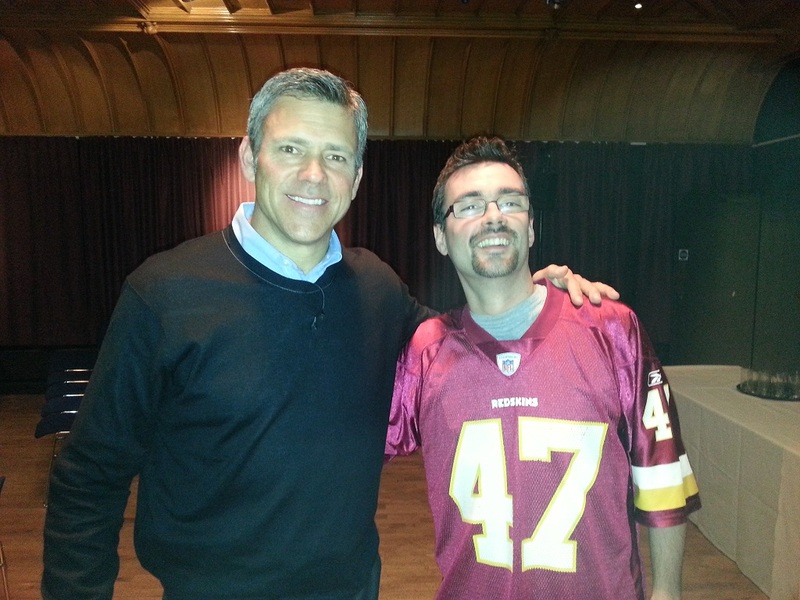 After the film it was on to the main event, a chalk talk and Q&A with coach Jeff Reinebold and NFL legend Mark Brunell, who just happens to be the last Redskins QB to win a playoff game! This portion of the evening was let down slightly by technical issues – Reinebold appeared to be having problems with his telestrator. Instead we got a live action demonstration of zone read blocking, during which he managed to “offend” Edinburgh Wolves head coach Don Edmonston with a jibe about offensive linemen’s athleticism. Other topics covered included the upcoming NFL games at Wembley and a look at each of the teams still in the hunt for this year’s Super Bowl, as well as answering questions from the floor. 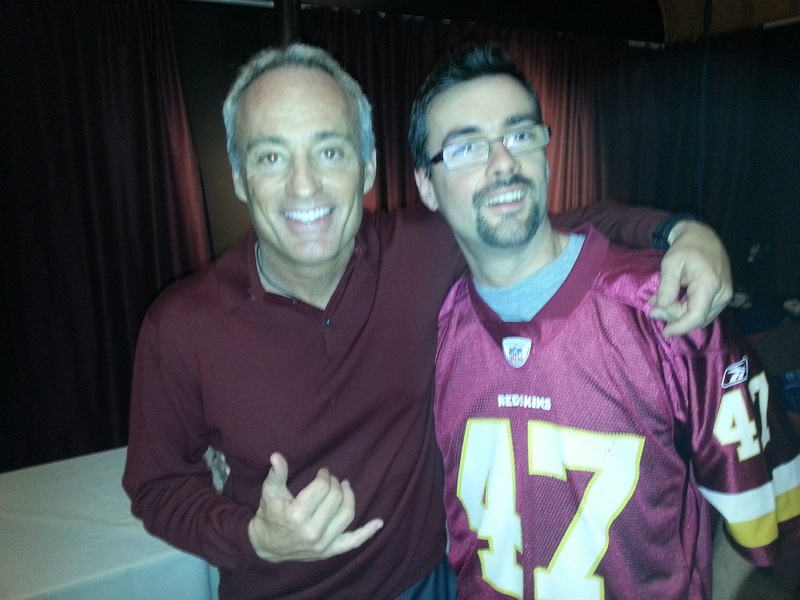 Things came to a close about 9:45,, and after getting pictures with Reinebold and Brunell it was time to head for home. I really enjoyed the evening, and felt like I learned a lot. Reinebold is a charismatic presenter, who makes even the complicated aspects of the game easy to understand (the game itself, he says, is actually pretty simple – something I’d agree with) and had the audience in the palm of his hand. As you’d expect of a 19 year NFL veteran, Brunell had some stories to tell, and it was great to hear first hand accounts of guys like Rex Ryan, Mark Sanchez and Drew Brees. Reynolds, too, was excellent, keeping the evening moving and throwing in some stories of his own. Similar events are being held tonight and tomorrow in Birmingham and Leeds, and I’m sure all those in attendance will enjoy them as much as I did. It’s great that the NFL are putting on events such as those, and bringing the game closer to far-off fans. As I wrote the other day, it’s all a far cry from the week old highlights we watched back in the 80s, and long may it continue! I’m already looking forward to the next event, whenever or wherever it might be. Glasgow would be nice! Believe it or not, I was a relative latecomer to American football. Channel 4 were well into their fifth season of NFL coverage before I decided to see what all the fuss was about, but it wasn’t long before I was hooked. This was sport like nothing I’d ever seen, and it very quickly ousted “our” football as my favourite. Of course it helped that my adopted team, the Washington Redskins, were rather good at the time. 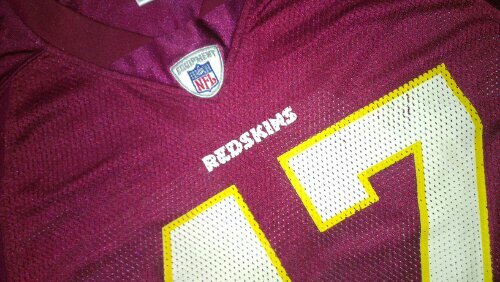 My first year as a Skins fan they reached the NFC Championship game (the Super Bowl semifinals for the uninitiated). In my second year Washington not only got to the Super Bowl, but won it in convincing style, beating a heavily favoured Denver Broncos team 42-10, and setting all sorts of records, many of which still stand. Good times! It should, of course, be pointed out that I didn’t pick the Redskins just because they were good. I’m not saying it didn’t help, but the biggest factor in that decision was having family who lived near Washington. I can’t remember if gifts of team merchandise were the cause or result of choosing the Skins, but it certainly didn’t harm, and 25 years on I still have all manner of programs, collectibles and newspaper clippings from that Super Bowl run. Back in those days, NFL coverage in the UK was very different. We got a highlights show on a Sunday evening, showing the best bits of games that has been played the previous week. There were other ways to find out the scores though. Telextext was one, and there were multiple weekly papers with game reports and other news, not just of the NFL but also of games played closer to home, in the various leagues springing up around the country. And for the really dedicated, there was US Armed Forces Network radio which broadcast live games on a Sunday night. Unfortunately the AFN signal was pretty weak, and it was common to lose commentary just as things were getting interesting. Things are very different today. Sky Sports have been broadcasting 2 live games on a Sunday night, and gradually other broadcasters have been getting involved as well. Most weeks this season had 5 live games shown across Sky, Channel 4 and even the BBC! And of course the internet has made a big difference, bringing us Brits the same level of coverage as fans in the US. 10 year old me would never have believed it would be so good in the future. This year I signed up to the NFL’s Gamepass package, allowing me to watch any game I wanted to, live or on demand, which for the first time ever has allowed me to see every game the Redskins have played. And I couldn’t have picked a better year, as Washington put 20 years of mediocrity behind themselves (those glory days of yore didn’t last) and finally appear to be a force again. It’s been a lot of fun to watch, and via the likes of Twitter to feel part of. Tonight, the Redskins will be hosting their first home playoff game since 1999, and only their second since winning Super Bowl 26 in 1992. To say I’m excited would be an understatement – I don’t think 10 year old me could be more excited. Poor Gem is fed up hearing about RG3 (aka Robert Griffin III)’s knee, or the state of the Redskins secondary. But I can’t help it – to get this far after so many disappointing years just feels so good. I’ve even got Heather singing along to the team’s fight song, Hail to the Redskins. Does that make me a bad dad? The Redskins go into tonight’s game against the Seattle Seahawks as 3 point underdogs, and most experts expect them to lose. So my playoff joy may be about to end abruptly. But we’ve been surprising people all year, and the experts aren’t always right. That’s why they play the games, after all. Me? I’m cautiously optimistic we’ll get the win. As a fan, it couldn’t really be any other way. Unless you’ve been living under a rock (or, I guess, don’t live in the UK) you’ll know that the Olympic flame is currently touring the country. Yesterday afternoon it was in our neck of the woods, but owing to circumstances (ie work and nursery) we missed it. We did talk about heading over to the other side of the city this morning, to see it leave for Inverness, but decided it was too early and too far to go for something that would be over in minutes. And anyway, aged 1 and 3, the girls won’t have a clue what’s going on and are unlikely to remember it. I did stick on the Beeb’s torch cam this morning, to see exactly what we were missing. Megan couldn’t have cared less. Heather was interested, but only for about three minutes. Then she got bored, and asked to put some kid songs on YouTube. Which, I think, backs up our decision not to go flame watching. And yet, part of me still thinks we should have made the effort. This is probably a once in a lifetime, never to be repeated event, and chances to be part of history don’t come round that often. Anyone who knows me will know that football – American, rather than Association – is my big sporting love, and has been for over 25 years now. Which is a very scary number, as it means I’ve seen more than half (56% to be exact) of the Super Bowls played. This year’s installment of America’s biggest sporting event, probably its biggest annual event, takes place in Indianapolis this Sunday. A long time ago I would write previews of big games, analysing each team, picking apart their strengths and weaknesses, and offering predictions. These were then emailed round various friends, and sometimes what I said actually turned out to be on the money. I’ve decided to revive that, in a form that will live on in posterity (unlike those old emails!). The Patriots’ road to the big game is one we’ve seen them take many times before – since 2001 they’ve won the AFC East division 9 times, and only once in that span have they failed to win at least 10 games. That said, the Pats weren’t the dominant force they’ve been in the past, with narrow wins over the likes of Washington, Miami, Buffalo and even Indianaoplis. Perhaps most significant of all was their week 9 loss to the Giants at Gillette Field – they Pats only home loss of the year. An omen for this Sunday? While the Patriots road to the playoffs looked fairly assured for most of the season, the Giants was anything but. A four game losing streak in November and early December left them with a series of must-win games in the last four weeks of the season. And win they did, beating Dallas twice to scrape past them and take the NFC East title. A dominant defensive front, coupled with some QB play from Eli Manning have been keys to the team’s success through the last few weeks of the regular season and into the playoffs. Without a dominant rushing game (they ranked 32nd in the league in both rushing yards and yards per carry) the Giants have relied heavily on veteran QB Eli Manning, and for the most part he’s done the business, throwing for just under 5,000 yards. Hakeem Nicks and Victor Cruz were the team’s leading receivers, combining for almost half (158) of Eli’s 359 completions. Good news for Giants fans is that NE’s defence gave up more yards than anyone except Green Bay. Not so good news is that for most teams those yards didn’t equate to points, as the Pats exhibited a “bend but don’t break” mentality. The Baltimore Ravens found this out to their cost, with four trips to the red-zone yielding just a single touchdown in the AFC Championship game. For New York to win they have to be able to finish drives consistently – field goals aren’t going to be enough. New England’s running game didn’t rank particularly highly either, but with Tom Brady under center, and an impressive array of receivers to throw to, they didn’t need it. Wes Welker and Rob Gronkowski led the way, combining for 212 of Brady’s 401 completed passes. Gronkowski’s fitness is in doubt for the big one, though, so Brady may need a big game from the likes of Aaron Hernandez, Deion Branch or even Chad Ochocinco to move the ball consistently. Up against them is one of the most consistently aggressive defensive fronts in the league. The Giants averaged three sacks per game in both the regular season AND the postseason. NY need to maintain this and keep the pressure on Tom Brady to have any chance of stopping the Patriots offense. Neither team has much to write about as far as special teams go, with both having fairly average punting and return games. New England would appear at first glance to have an edge in the kicking game, with Stephen Gostkowski having a better overall success rate than Greenock-born Lawrence Tynes. However, most of Tynes misses have come outside the 40 yard line, so the kickers are fairly even too. Weighing all of the above up, I’m going for a 23-20 Patriots win. We’ll see if I’m right on Sunday night. If you’re in the UK, you can watch the Super Bowl in HD, on BBC 1 or Sky Sports, this Sunday. Kick off will be around 11:15pm.